Breakfast is the most important meal of the day, so people say. You shouldn't skip breakfast. You should try and have a healthy breakfast. But when you're not very imaginative and don't want to spend hours preparing a healthy but filling breakfast what do you do? This is something I've struggled with for years. I used to have one slice of toast but I was always hungry before lunch and it left me feeling a bit, well, a bit "meh". I tried having bagels for a while but they were too heavy. A boiled egg with a slice of toast was next and that was great for a while but boiling an egg takes time that I just don't have in a morning. That is until I spied a brilliant breakfast idea over on Claire's blog I Wasn't Expecting That. 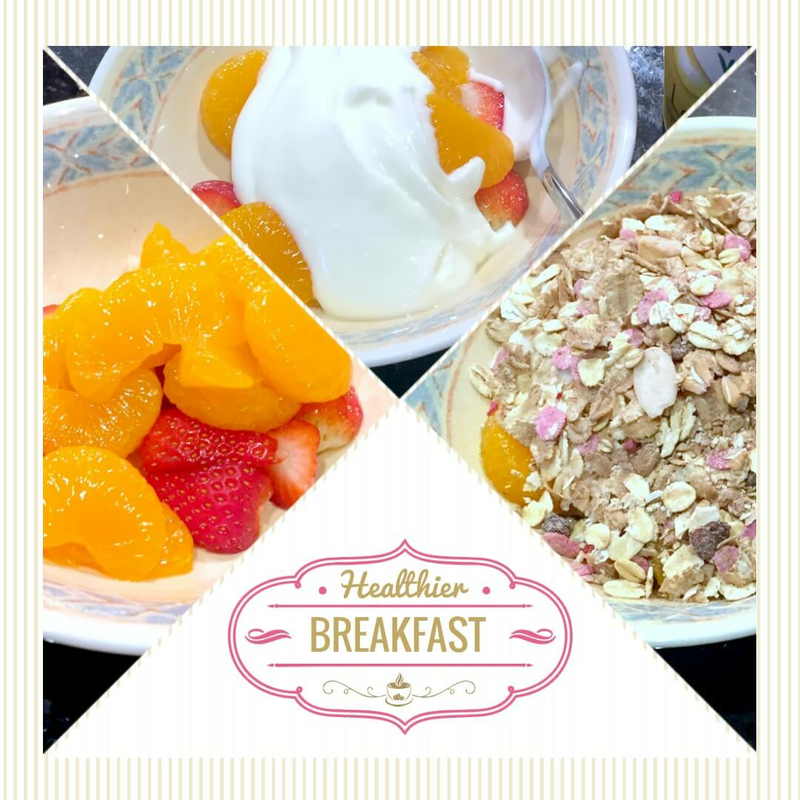 Fruit, cereal (or granola), and yoghurt, it sounded delicious and I was determined to try it. I have been trying to cut down on my sugar intake and looking at labels on food is helping. After reading Claire's post I headed to Tesco to search for my new breakfast idea. 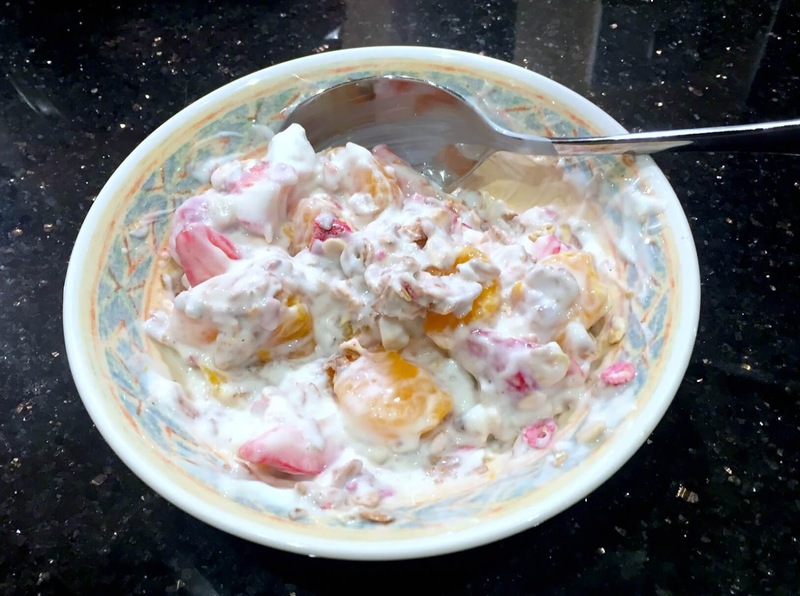 To start with I chose strawberries, mandarins, and a lemon flavoured yoghurt. I really don't like natural yoghurt, it may be because I'm so used to sugary things that the natural yoghurt isn't sweet enough, but I chose a low sugar (I think) yoghurt. 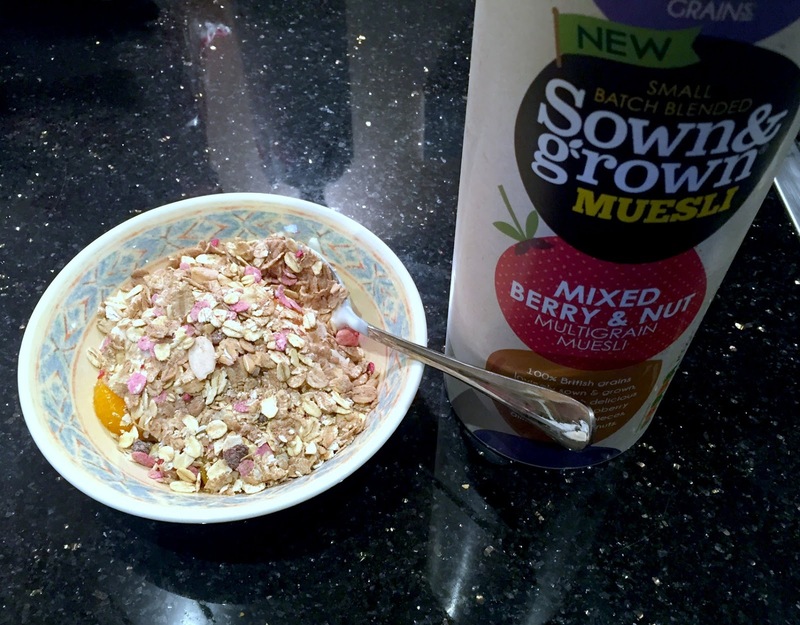 I then received the Sown & Grown Mixed Berry & Nut Muesli to review. It came at the perfect time. I chopped up my strawberries first and put them in the dish, then added my mandarins. I love mandarins, they're so tasty and are perfect for the morning. Next I added two tablespoons of my yoghurt and poured the Sown & Grown Muesli on top. The muesli consists of 100% British grown grains and comes in a resealable tube to keep it fresh. It's exclusive to Sainsbury's and there are other types to choose from. They have Apple & Raspberry, Four Grain, Mixed Berry & Nut, Three Grain, Apple & Blackcurrant, and Nuts & Seeds. You can buy a 450g tube for £3.95. After mixing my breakfast doesn't look quite as appetising but it is yummy. This breakfast is far more enjoyable than a slice of toast, and it doesn't leave me feeling hungry. In fact after eating this healthier breakfast I feel better. My body feels lighter somehow, if that makes sense? It's like a breath of fresh air. Where the weight loss is concerned I'm doing okay. Okay, not great. Since last week I've lost 2.3lbs and hopefully that will continue. I'm still above 13stones and getting below that will be a nice milestone. Short targets are what I need and I'm concentrating on that at the moment. One positive change I have made this week is paying attention to the sugar content of all my food and making healthier choices when shopping. Usually for lunch the Hubby and I would have something with a tomatoey sauce similar to Dolmio, but I've changed that. Today we're having Ciabatta with a tomato salsa, a fresh salsa that I'm doing myself!! This is definitely a change because it's not something I've attempted before, it could all go horribly wrong but I'm keeping my hopes up. I have faith in myself, I can do this. I'll let you know how the salsa goes. How's your weight loss going this week? I was sent the Sown & Grown Muesli free of charge in exchange for a review. All opinions are my own. I am useless at eating breakfast...Usually I get something on the go. I usually eat wholemeal toast which helps abit, but I need to get back into fruit and yoghurt as that keeps me full until lunch and helps me sneak in more fruit! I did that too, the wholemeal toast thing, and it was great but I always found I was super hungry before lunch. Like you said, sneaking in more fruit and yoghurt definitely feels more healthy.